Do you have digestion problems? It can range from the occasional burp or passing gas or upset stomach to something much worse. As Americans it seems we are often victims of stomach upsets. From the sale of antacids, Pepto Bismol, Gas-X and such it seems like everybody has some kind of problem. There are good reasons that the average American has digestive issues. Our bodies are designed to take the living enzymes in our foods and combine them with those that the body makes. These are then used to digest the foods, starting in the mouth and working all the way through the colon. When we eat cooked and processed foods we are killing the enzymes before we eat them. This means the body has to work even harder at making enzymes. The ‘enzyme factories’ rely on the minerals in the foods for their raw materials, as well as the proteins and other nutrients from the foods. Many of our soils are mineral poor, so our food is mineral poor. All this leads to a lack of enzymes available to digest our foods. Fortunately you can supplement with enzymes. You can get them in blends that will help you digest anything or as individuals if one type of food bothers you more than others. People who have had their gallbladders removed typically find that Lipase eases their digestive issues caused by eating fats. Another thing we as Americans typically lack are the good bacteria that belong in our bodies. Cooking the foods, growing them with pesticides, washing them with antibacterial soaps and irradiating them all contribute to killing the good bacteria that belong in and on our foods. These bacteria are meant to help us in the digestion process, especially in the colon. Lacking these can lead to colon damage and a problem called Leaky Gut Syndrome. The solution is to eat fermented foods and possibly supplement with probiotics. You will need to heal the colon once the damage has been done. There are multiple ways of doing this, but the GAPS diet is the best known. If you are doing these things right, eating natural and raw foods, taking enzymes and taking probiotics and you still have the occasional upset there are many herbs that are very helpful in calming and healing the gut. They include sage, oregano, rosemary, lavender, peppermint, thyme, ginger and chamomile. Most of them can be taken as seasonings in our foods, teas or capsules. Ginger and peppermint are probably the best known. 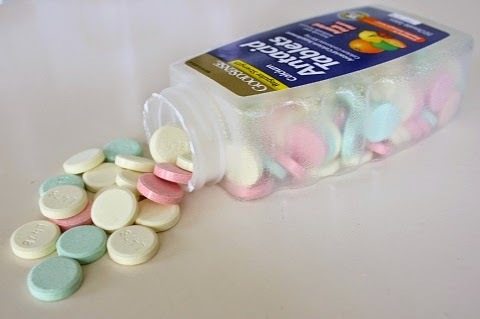 Many people take antacids instead of herbs. True, that little roll is much more convenient to carry than a plant or a jar of pills, but what are the consequences of antacids? These work by blocking the stomach from making acid. The acid is in the stomach to activate the enzymes for digesting the food. Without enough acid there will be little or no digestion. Some of the nutrients we miss out on when we lack stomach acid are iron, B-12, folate and zinc. Our whole body will be healthier, including our hair, skin, mind and energy levels when our digestion is working right.